Some fiction is escapist in nature, it gets the reader out of her own life and into a fantasy world, far away from reality. Some fiction is more introspective, turning the reader's focus in on herself and her life rather than outward into an imaginary setting. What Alice Forgot prompted a period of deep pondering which didn't end for me when I closed the book. * not to mention that her style and fashion sense has completely changed from casual and comfy to sleek and high-maintenance. Talk about a rude awakening! Alice has literally become a stranger to herself and she's pretty sure she doesn't like the person she's become. The doctors assure her that her memory will return eventually, but she leaves the hospital still missing the last decade of her life. There were a few distracting plot points that just didn't add up. The doctors let her leave the hospital with a decade of her life missing without any follow-up. Her almost-ex-husband let the kids stay with her even though she didn't have any recollection of them and couldn't remember basics like where their school was. Alice tries to reconnect with her husband, to understand how their loving relationship - back in 1998, he told his friend "I love her more than oxygen" - deteriorated to the point where he yells obscenities at her over the phone, but everyone was so secretive and hesitant to tell her anything about her life or the events she couldn't recall! 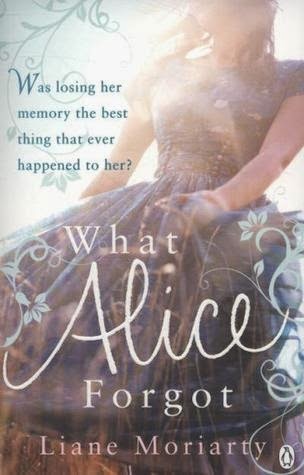 There are also two other plot lines told alongside the main story, one involving Alice's sister, Elisabeth, and her therapist-assigned "homework" dealing with her infertility, and the other centering around letters their "adopted" grandma writes to the fiance who died a week before their wedding. Both provided interesting insights into those two characters, but drew attention away from the central focus on Alice. The plot wasn't perfect, but it was so thought-provoking. What if I lost my memory of the past decade? How am I different now from the Emily-of-ten-years-ago? (At one point, Alice observes that "Everyone was so tired and cranky in 2008." I can sympathize; I'm pretty sure I'm more tired and cranky now than I was ten years ago!) Would Emily-of-ten-years-ago like the person I am now? be proud of her? pleased with how she...er, I...turned out? What changes are for the better and which are for the worse and how can I evaluate that? How much influence do the friends I have chosen to spend time with have on the person I've become? What should I strive to regain from that earlier, simpler time? Ultimately, What Alice Forgot is a hopeful, redemptive story. The title has a double meaning. Initially Alice forgot those missing ten years of her life, but Alice-of-the-present had also forgotten so much of who she had been, how much she loved Nick, and what was ultimately most important to her. Relinquishing pride, accepting responsibility, recognizing that love isn't always "light and bubbly" are vital parts of a healthy, lasting relationship. Remembering that lost decade that helped shape her into the person she became was important, but so was remembering Alice-of-ten-years-ago and choosing to hold on to some of those memories tighter than the more recent, painful ones.